This volume accompanies a major international loan exhibition featuring more than three 300 works of art, many rarely or never before seen in the United States. It traces the development of gold working and other luxury arts in the Americas from antiquity until the arrival of Europeans in the early 16th century. Presenting spectacular works from recent excavations in Peru, Colombia, Panama, Costa Rica, Guatemala, and Mexico, this exhibition focuses on specific places and times— crucibles of innovation— where artistic exchange, rivalry, and creativity led to the production of some of the greatest works of art known from the ancient Americas. 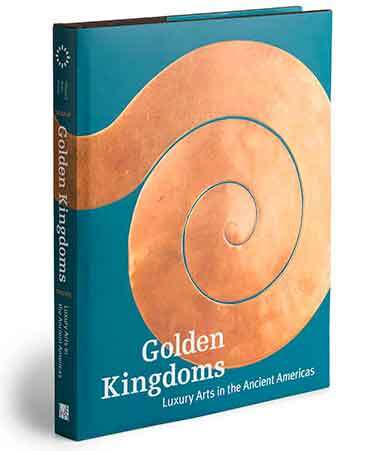 Golden Kingdoms creates new understandings of ancient American art through a thematic exploration of indigenous ideas of value and luxury. Central to the book is the idea of the exchange of materials and ideas across regions and across time: works of great value would often be transported over long distances, or passed down over generations, in both cases attracting new audiences and inspiring new artists. The idea of exchange is at the intellectual heart of this volume, researched and written by 20 scholars based in the United States and Latin America. Joanne Pillsbury is the Andrall E. Pearson Curator in the Department of the Arts of Africa, Oceania, and the Americas at the Metropolitan Museum of Art. Timothy Potts is director of the J. Paul Getty Museum. Kim N. Richter is senior research specialist in the Director’s Office at the Getty Research Institute.